There are many things that make these metal mini picture frames such great grad party favors. Not only can they be used as give-aways, but the also can be used as place card holders if you are having a sit-down meal. They are also great as elementary, middle school, high school and college graduation favors. 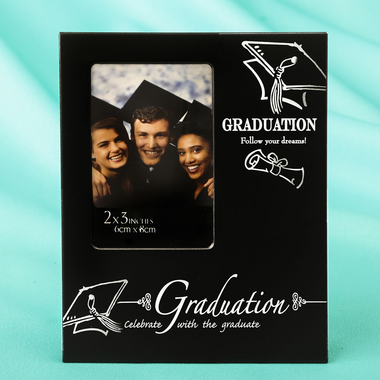 Measuring 4 1/8" x 4 7/8", each black and silver graduation frame holds a 2 x 3 inch photo. The words 'Graduation - Follow your dreams' are displayed along with a white graphic scroll and graduation cap. You will also see the words "Graduation...Celebrate with the Graduate" on the bottom. Each frame is packaged in a clear box.